In today’s rapid-paced online world customers use many ways to say they appreciate you. 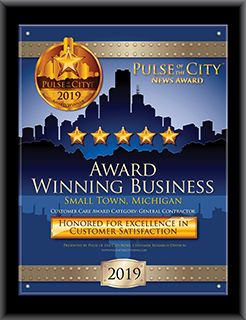 Here at Pulse of the City News, our award has received a multitude of acknowledgements from our customers who have received the award and have used it to generate new business by using our custom materials, trademarked images and marketing packages to help brand their company as an award winner. We want to share with you how our customers have shown their appreciation for the Pulse Award. Some of these examples have come from recipients’ websites, social media, press releases, staff parties and more. “Thank you very much. Also love it when Pulse of the City writes on Maynard Roofing Facebook that's fantastic. I got all the links all the information you put out is invaluable love the job that you guys do and I'll just keep doing the job that I do and folks will be happy and dry :-) thanks again. Have a great rest of your weekend! Great working with you!"